Following claims of financial impropriety, the APSARA Authority denies any wrongdoing. 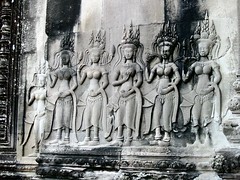 Last year, independent researcher Kent Davis made the news with his theory that Angkor temples were a monument to women and to this end was hoping to analyse and quantify the traits of every apsara/devata image (over 1,700 in all). The Phnom Penh Post recently carried an update on Davis and his work and features, quite prominently, the discussion that on this website about Davis’ work (which you can read here). What didn’t really come through in the PPP article was theÂ paper on the facial pattern recognition study presented at the International Conference on Pattern Recognition in Istanbul, Turkey (it was buried somewhere in the middle of the article). The Cambodian Daily has a better-written paper on the article which you can read on Davis’ site, along with a download link to the facial recognition paper. The work is still very much in a preliminary stage, but quite promising and may potentially find correlations between types of faces with ethnicities or locations within the temple complex. 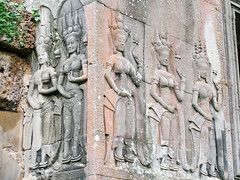 It will be interesting to see what kinds of patterns emerge from a deeper analysis of the quantified attributes of the apsara/devata carvings emerge.